Cauliflower. It just immediately conjures up delicious thoughts, doesn’t it… ehh hem, doesn’t it? …hello?! I know, cauliflower is not at the top of many peoples list of good eats. However this soup, from Bobby Flay’s Mesa Grill Cookbook, is really great! 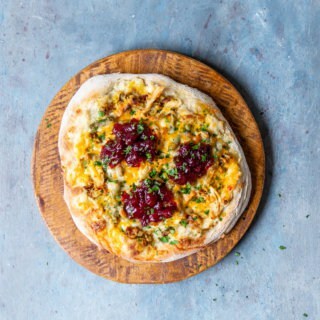 It gives the humble cauliflower a starring role, showcasing its soft, smooth, velvety texture and pairing it with the flavorful kick of roasted poblano chilis. Perfect for a cool fall or winter day, this thick and creamy soup with warm you through and through! Preheat your oven to 350°F. Cut 2 heads of cauliflower into florets of roughly the same size. 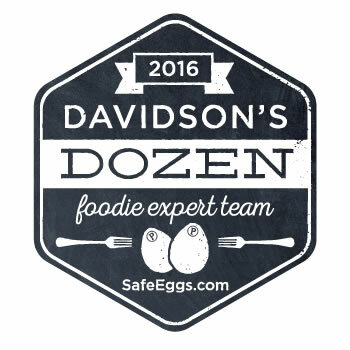 You want them to be around the same size so that they cook evenly in the oven. 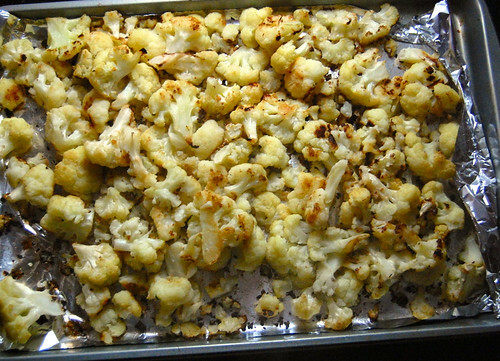 Place the cauliflower in a single layer on an aluminum-foiled lined baking sheet. Drizzle some oil (olive or canola will work just fine) over the cauliflower, somewhere around 3 tablespoons. Then season generously with Kosher Salt and Freshly Ground Black Pepper. Take your hands and move the cauliflower all around to evenly coat the florets with the oil, salt, and pepper. Roasting the cauliflower, as with all vegetables, brings out and concentrates its natural sugars. The cauliflower slightly caramelizes during the process, transforming it into something so much better than just, well, cauliflower. This roasting “trick” works with all vegetables by the way… it’s absolutely my favorite way to eat vegetables. At this point, scrape the cauliflower into a sauce pot and add around 4 cups of chicken stock. You can make your own, which is definitely time consuming but super easy and delicious (recipe for that at the bottom of this post) or you can use store bought chicken or vegetable stock. Obviously, buying stock is the easier route to go, but make sure to buy quality. I typically use Trader Joe’s brand, but I’ve heard that Cooks Illustrated is partial to Swanson. Bring the cauliflower-stock mixture to a boil over medium-high heat, then lower to a simmer and let it go for about 15-20 minutes. 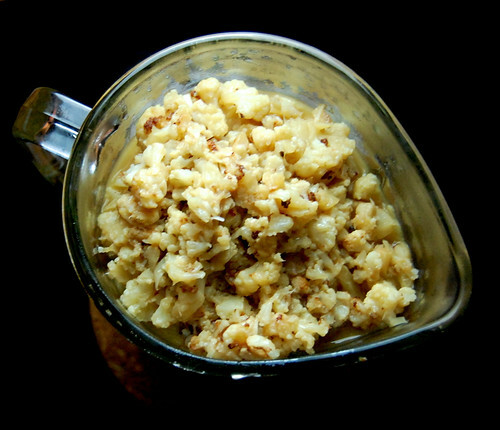 Let cool, then transfer cauliflower to a blender with a slotted spoon. Add in just a couple cups of the stock and purée. Add in more stock as you see fit, until it reaches a thick soup consistency. You might use all the stock, you might not, depending how thick you want the soup to be. Pour the soup through a fine mesh sieve placed on top of a large bowl. Stir the soup through the fine mesh sieve and discard any solids left behind. *If you aren’t planning on serving the soup right away, you can refrigerate the cauliflower soup mixture at this point for a day or two until ready to serve. Last step is an easy one: pour the cauliflower mixture into a pot and bring to a simmer over medium-low heat. Stir in about 3/4 cup of heavy cream and 2 puréed poblano chiles (keep reading for how to make that). Season with salt and pepper heat until warmed through. When the cauliflower was done roasting in the oven, crank up the heat to 375°F. It’s time to roast 3 poblano chiles and 1 red bell pepper. 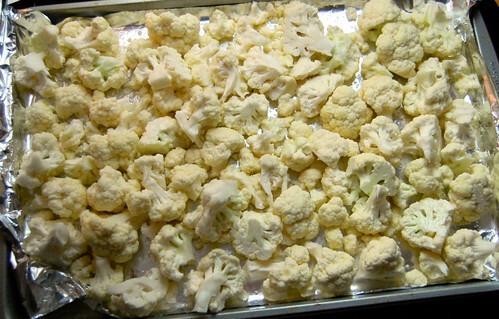 Same process as the cauliflower: put the peppers on an aluminum-lined baking sheet and drizzle with a tablespoon or two of canola oil and sprinkle with Kosher salt and pepper. Use your hand and toss the peppers to evenly coat with the oil. (In the picture below, there are more peppers than you need for this recipe… I was roasting up some additional ones for some other eats). Place your peppers in a bowl and cover with plastic wrap for at least 10 minutes. This process will create steam, making the skins easier to peel. After the 10 minutes (or longer) has passed, peel the skin off the peppers with your fingers and remove the seeds from inside the peppers. The skins should slide right off, but you may have some stubborn spots here and there. ***You might want to wear gloves when peeling and handling these poblano chiles. They can leave your hands (and anywhere your hand touches) with a burning sensation. So remember, the puréed poblanos = soup / the finely chopped poblano and red pepper = part of garnish. Okay, it’s plating time! Fill bowls with your soup. I like to garnish mine with a couple cilantro leaves and a “pepper relish” of sorts. Here’s how you make it: Take that finely chopped roasted red bell pepper and poblano chile and place them in a bowl. Hit it with a splash of red wine or sherry vinegar and a squeeze of honey (equal parts honey/vinegar, somewhere around 1 tsp – 1 tbl each). Throw in a pinch of Kosher salt and Freshly Ground Black Pepper. Taste and adjust the honey/vinegar/salt/pepper as necessary. This “relish” adds beautiful color to the soup and also brings an added depth of flavor. 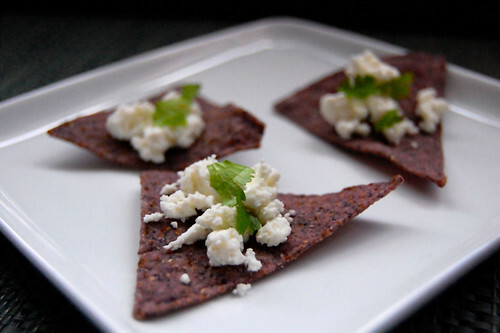 Serve some blue corn chips on the side with softened fresh goat cheese. The tangy-ness of the goat cheese goes really well with the richness of this soup. You are probably going to want more than 3 tortilla chips, but for this picture I just thought it looked nice. Cauliflower gets a starring role in this thick and creamy soup recipe, with the help of a flavorful kick from roasted poblano chiles. 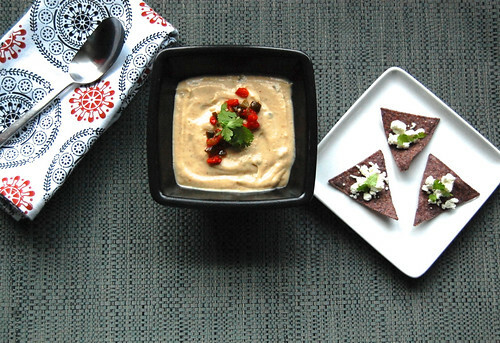 This rich and velvety soup will warm you through and through! Preheat the oven to 350°F. Put the cauliflower on a large baking sheet covered in aluminum foil. 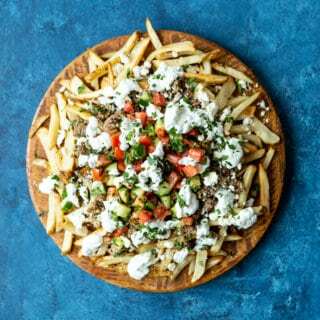 Drizzle with approximately 3 tablespoons of the oil, season with Kosher salt and freshly ground black pepper, and toss to coat. Place the cauliflower into the oven and roast, stirring the cauliflower around a bit halfway through the process, until the cauliflower starts to turn golden brown and is soft, about 25 – 30 minutes. Raise the heat of the oven to 375°F. 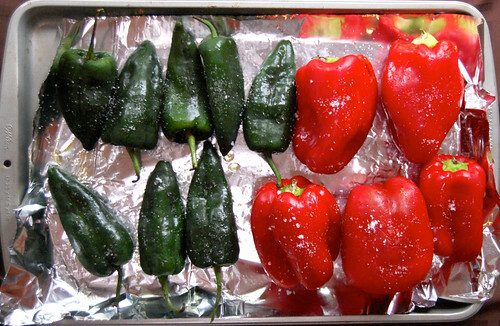 Place the 3 poblano chiles and 1 red bell pepper on a baking sheet covered in aluminum foil. Drizzle with approximately 1 tablespoon of oil, season with Kosher salt and freshly ground black pepper. Toss to coat. Place the tray of peppers into the oven and roast for about 20-30 minutes, turning/rotating with tongs about every 6-8 minutes, until the peppers are blistered with brown char marks and the skins are wrinkled. Remove from the oven and place the peppers in a bowl, cover with plastic wrap, and let sit for at least 10 minutes. This will allow the skins to loosen. 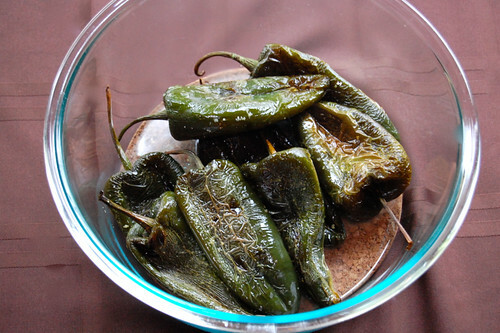 Remove skins and seeds from the chiles and pepper. 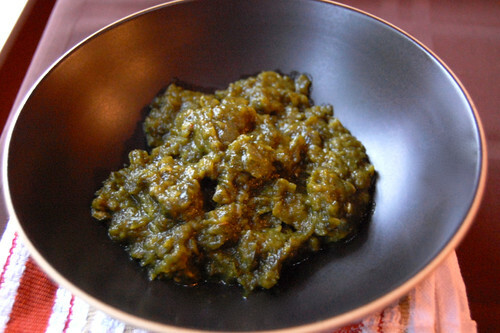 Place 2 of the roasted poblano chiles into a blender or food processor and purée. Finely chop the other roasted poblano chile and roasted red bell pepper. 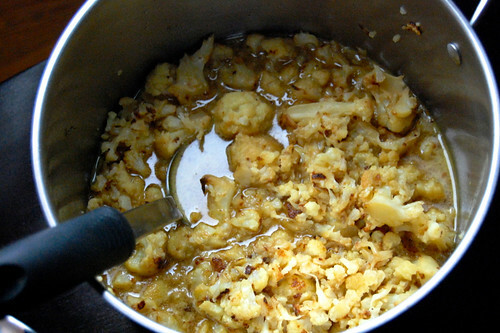 While the peppers are roasting, scrape the cauliflower into a medium saucepan and add the stock. Bring to a boil over medium-high heat, then lower the heat and simmer for 15-20 minutes. Let cool a bit and then ladle all of the cauliflower with a slotted spoon from the saucepan into a blender. Add a couple cups of the stock. 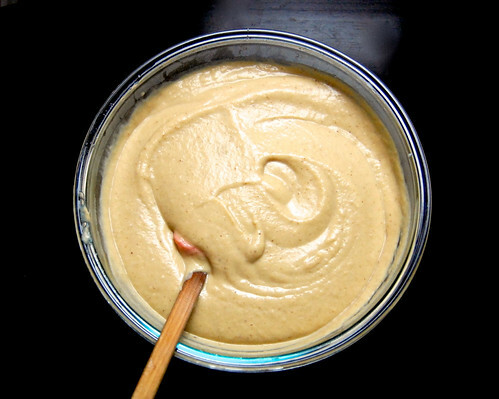 Puree until smooth, adding more of the stock from the saucepan until you reach a thick soup consistency. You may use all the stock, you may not, depending how much cauliflower you have and how thick/thin you want your soup to be. Strain the soup through a fine mesh sieve into a clean pot. The soup can be made up to this point a couple days in advance. Store in a covered bowl in the refrigerator. When ready to serve, bring the mixture to a gentle simmer over medium heat and whisk in the heavy cream and poblano puree. Season with Kosher Salt and Freshly Ground Black Pepper. Cook for about 5 minutes, or until just warmed through. Meanwhile, prepare the “pepper relish” garnish. Combine the finely chopped roasted poblano chile and red bell pepper with a splash of red wine or sherry vinegar and a squeeze of honey. The vinegar and honey should be approximately equal parts. Season with salt and pepper. Taste and adjust seasonings to your liking. This can be made a day or two ahead of time. 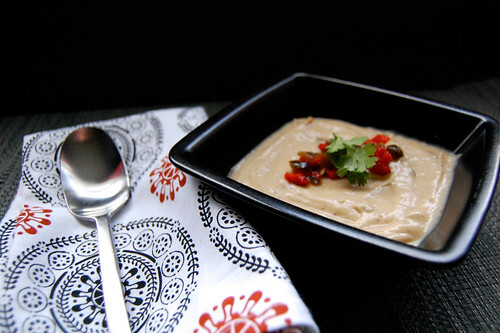 Serve soup in bowls topped with a little of the pepper relish and a little chopped cilantro. 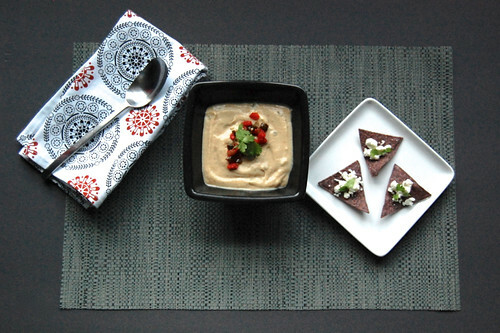 Serve alongside tortilla chips topped with softened goat cheese. This recipe has been slightly adapted from Bobby Flay’s Enriched Chicken Stock found in the Mesa Grill Cookbook. Preheat the oven to 400°F. Place the chicken parts (I used just necks because they were really cheap) on a large baking sheet and drizzle with the canola oil. Toss the chicken pieces to coat with the oil and season with Kosher salt. Place in the oven and roast, turning once half way through, until they start to turn golden brown, about 30-40 minutes. Transfer the pieces of chicken to a large stockpot and add the rest of the ingredients as well as approximately 3 1/2 quarts of cold water. Bring the mixture to a boil over high heat, then reduce the heat to medium and let simmer, uncovered, for 3 hours. Strain the stock through a cheesecloth-lined strainer (you can probably use a fine mesh sieve as an alternative) into a large saucepan and discard the solids. Put the saucepan over medium-high heat and boil the stock until reduced to approximately 6 cups, around 20 – 30 minutes. Let the stock cool to room temperature and then refrigerate until cold, at least 8 hours or overnight. Once cold, remove the layer of fat that will have risen to the top and discard. The stock may be covered and refrigerated for up to 2 days or frozen for up to 3 months.